Built 1845-1847 by Emilio Jover Perrón. Opened 25 Sep 1847 with Antonio Gil de Zárate's drama "Guzmán el Bueno". In the Spanish Civil War, damaged by bombs on 28 Feb 1939. 1939-1941 rebuilding by Juan Vidal Ramos. 1985-1992 rebuilding and restoration. 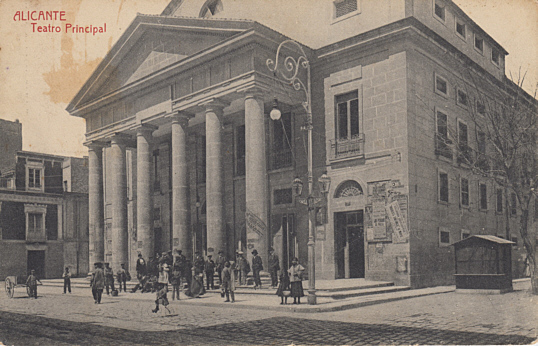 Front Text: "Alicante - Teatro Principal"